All, I'm planning to retrofit D2S Projector in my 2016 Nissan Rogue SV. It has LED daylight and factory halogen. I tried to measure without removing and i think D2S will fit. Anyone done the retrofit ? please help. I prefer morimoto as i dont know the brand of lens im going to get in the headlight assembly. What you guys think ? I'm sure this is a common retrofit. Lightwerkz just did one with a D2S 5.0. Thank you. Thats good to know. What exactly is difference between DS2 4 and 5 ? I see Lightwerkz has a 30 discount on 4. Different cutoff step. Slightly different beam. If you check out lightwerkz youtube channel they've done some good side by side comparisons. Thanks again. Do you have any reference for someone did step by step for this car ? Sorry, no. But the process is no different really than any other reflector headlamp. Not sure if the Rogue lamp uses butyl or permaseal so depending on the type will determine your heating method for lens removal. For installation of the projector you can opt to use the threaded shaft for ease of installation but since the Rogue is H11 based, the bulb hole will need to be expanded to accommodate the larger diameter shaft. Here is a video to explain the process. 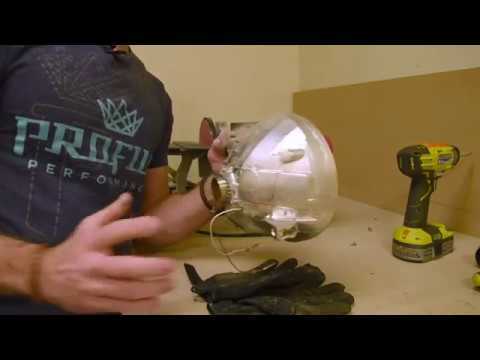 This lamp that Matt is working on is H4 based so the hole is larger and it requires less effort to expand the hole. The H11 will require more material to be removed. Thanks again. I contacted lightwerkz and they told me that DS2 will be tight and it will take lot of time to do this conversion as well as different method to mount. Bolt one and not easy. Seller says it will take Either H7 or D2H bulbs. Which one i should order ? what do you think about this setup. I would never buy aftermarket headlights. There is a high probability that the projector inside is of poor quality and will have low performance. Especially when compared to other popular high performing xenon projectors. For that price, you can find *like new* condition OEM LED projectors on ebay if you search hard enough. They may not be as intense as a xenon projector but their much better than halogen and much better than the aftermarket Chinese crap. Lightwerkz saying H1 might be better for DIY and i can still do thread mounting. But D2S will be difficult and it costing 1k plus. Too expensive for me. Should i try H1 route ? In Ebay, LED projectors (used) and not perfect. Missing tabs here and there. So i dropped that idea. Any opinion about Eagle eyes lamps ? I do not trust Eagle Eyes either. Poor quality. They are beneath companies like TYC and Depo. Do not fall victim to the *pretty* appearance of these lights or any other aftermarket headlamp assemblies. They truly do lack high quality materials, craftsmanship and most importantly of all optical engineering that OEM lighting manufacturers possess. Mini H1 is still a viable solution due to ease of installation and cost. My only gripe with this option are the bulbs. A D2S projector will always be better because you can use high quality Philips or Osram xenon bulbs which will always have better performance than any H1 xenon bulb. But in the end you can still have very decent lighting with Mini H1. And like I said if you *search hard enough* on ebay you will find good affordable like new headlamps. Both left and right lamps have no broken tabs and both have no marks on the lens. I will post the links in the next post in case this post gets quarantined for including links. If you do not see my next post immediately after this one, then you know it has been quarantined until a moderator approves it. Thank you. So get these and do d2s or h1? As it already has protector won't it be easy to do d2s? Those have LED projectors. No need to take them out and spend more money for xenon projectors. Installation to convert from LED to xenon will be much more difficult as the back of the housing is sealed with no opening. Or you can just go with the Mini H1 and retrofit them in your original headlamps. Just one more thought.. if i buy the halogen used off ebay or aftermarket for less than $200 and then get H1. That way i dont damage the original and i can sell if required back in Ebay ? do you think this is good idea ?